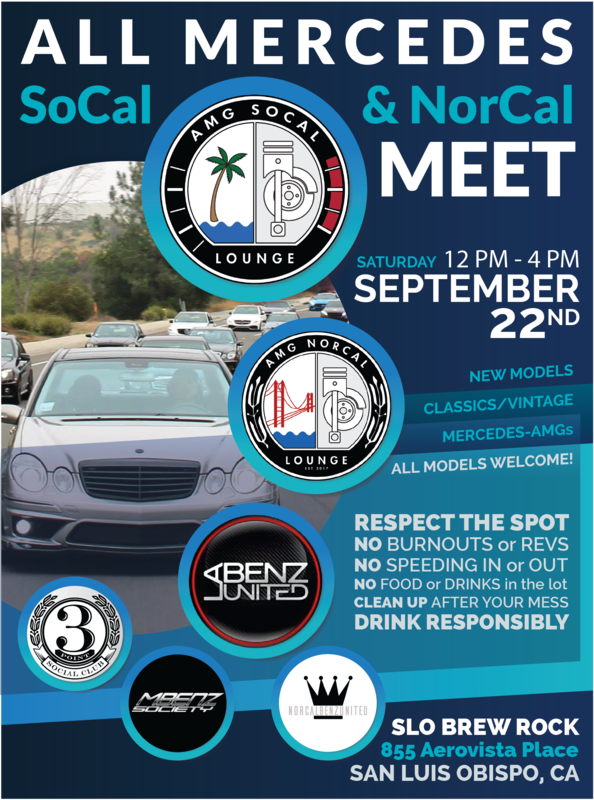 We are getting together with Mercedes communities to do a SoCal + NorCal Mercedes Meet in San Luis Obispo! WHEN - Saturday, September 22nd 2018 from 12pm to 4pm. WHERE - SLO Brew Rock, 855 Aerovista Ln, San Luis Obispo - https://*******/maps/aqdjhAd47Hq. 9:00 AM Meet in the street in front of Elite Global Farming & Logistics, 635 Sanborn Pl, Salinas - https://*******/maps/fNNKJJt1iM62. 9:30 AM Caravan heads to SLO Brew Rock, 855 Aerovista Ln, San Luis Obispo. 4:45 AM Meet at the Whole Foods Market Del Mar - 2600 Via De La Valle, Del Mar - https://*******/maps/mehvbkn1KDE2. 5 AM Caravan heads to OmniPlatform Corporation, 8801 Research Dr, Irvine - https://*******/maps/Hvqn3dEK4uT2. 6:00 AM Meet at OmniPlatform Corporation, 8801 Research Dr, Irvine - https://*******/maps/Hvqn3dEK4uT2. 6:15 AM Caravan heads to Bowlero Woodland Hills, 23130 Ventura Blvd, Woodland Hills - https://*******/maps/GU83TkUKU4E2. 7:30 AM Meet at Bowlero Woodland Hills, 23130 Ventura Blvd, Woodland Hills - https://*******/maps/GU83TkUKU4E2. 7:45 AM Caravan heads to SLO Brew Rock, 855 Aerovista Ln, San Luis Obispo - https://*******/maps/qm71SiSRvYA2. Bring your cameras, GoPros and drones!